Roy Nelson made his way back into the octagon for the first time since his knockout win over Antonio “Bigfoot” Silva in September 2016. Alexander Volkov stood across from “Big Country” at “UFC on FOX 24” on Saturday night hoping to take out one of the biggest names the division has to offer. 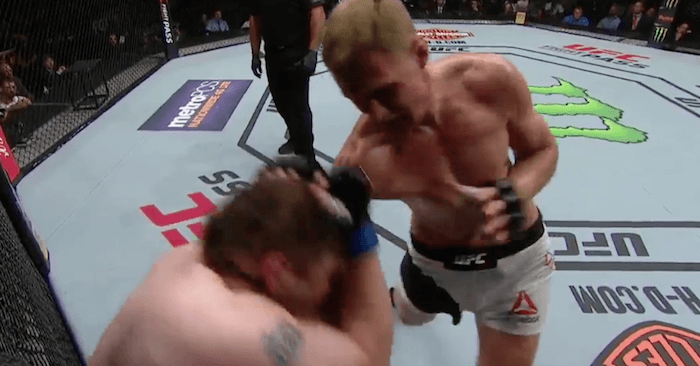 Volkov tried his best to utilize his eight-inch reach at the start of the opening round, keeping Nelson at bay with pawing jabs and kicks. Volkov pressed Nelson up against the fence and worked some knees to his gut. Nelson forced Volkov up against the fence and looked to drive some air out of Volkov, hoping to fatigue him. Nelson secured a trip takedown, but Volkov was able to pin his own back against the fence to prevent Nelson from transitioning. The referee stood them up due to inactivity and Volkov tried to catch up with some massive shots of his own when he pinned Nelson up against the fence. Nelson fired back with a few of his own, but the end of the round saw Volkov walk back to his corner with a ton of momentum. Nelson went right back to trying to drive the energy out of Volkov when he pushed him up against the fence, making him carry his body weight. Volkov worked his way back to the center of the octagon and it seemed like Nelson’s strategy worked because Volkov’s hands were by his side, clearly starting to get fatigued. Nelson landed a lunging left hook that forced Volkov to circle away. No matter how deep into the round it was, Nelson always mustered up enough strength to fire off that massive right hand that could put anybody to rest. Nelson, as expected, went right back to the overhand right but he failed to find a good distance to strike from on the giant. Volkov enjoyed the reach advantage not just because of his offense, but because it made his defense a bit easier. Nelson actually started landing with success in the second half of the final round because he was attacking straight down the middle rather than on the outside. Still, the jabs and leg kicks and teep-kicks of Volkov gave him the offensive edge throughout the fight. Nelson stuck to the center of the octagon and just when he thought he had a good angle to strike on, Volkov would change his stance and force Nelson to re-assess his plan of attack.